NeverSeconds: Big weekend, bigger week! This week started with me worrying about Ms El, Zee and Sunflower in the storm. I'm glad they are OK but their school hasn't reopened yet. Maybe they will tell us about it when they get back. There are lots of packets of things I have not seen before like the Veggie Straws. Do you have information on the packet like we do on our food? It's a really big weekend because Mary's Meals are celebrating tomorrow! They are ten years old and everyone is welcome to join the celebration in Glasgow tomorrow. I am going and there is going to be a film premiere! The film is called 'Child 31' and there will be a special guest. I don't know who it is. The BBC are showing our documentary on the BBC News Channel this weekend. I get embarrassed watching myself on television! It is good though so please watch it if you can. I am smiling all the time at the moment because it's not just Mary's Meals that are ten next week. I'll be in double figures too! Happy Birthday to Mary's Meals, and also, happy birthday to you too Martha! Happy birthday Veg, you have done more than in your first 9 years that many will do their entire lifetimes!! Seems "Perfect Portions" (the name of the company that makes Veggie Straws) isn't saying. I did manage to find a bit of nutritional information about them. At least they appear to be a bit "healthier" than a lot of snack options, but I think it's pretty obvious that you'd be better off just eating some carrot sticks than processed "Veggie Straws." I have just watched the documentary on BBC News. As a teacher and social entrepreneur, I am so inspired by your blog and the commitment to the work in Malawi. You are fantastic. Whilst mixing the porridge, I heard that you were suffering from smoke in your eyes. I can only imagine this to be the same for the people cooking it on a daily basis. Research shows that almost two million people die prematurely from harmful smoke inhalation and my organisation has designed a product that diverts harmful fumes away from the cook through its chimney. The stove also sanitises water whilst cooking thus reducing the distance a child has to travel for clean water. Please click on the link below for more information. We would greatly appreciate your support. I've pre ordered your book, one for me and one for my daughter. I'm also talking to my daughter's school about using the book and website as a resource. And I've been sending messages out to everybody I know about your work. You are a true inspiration. Let's hope more young people follow your example. We love you. Keep up the good work. I am also in double figures and my birthday is just weeks away, although sadly my double figures are far more advanced than yours. Happy Birthday also to Mary's Meals. The Hain Celestial Company, known for its healthier foods and teas, is the manufacturer. The package claims it has 30% less fat than potato chips, has all natural ingredients, uses sea salt, with no preservatives. The product is kosher certified. Happy tenth birthday Veg and Mary's Meals! 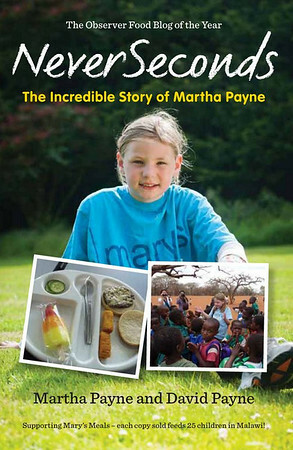 Just saw the BBC doc about Martha and the help she was able to muster for the children of Malawi. Was the most hopeful thing we have ever seen on the telly. We set up a monthly direct debit to Mary's Meals that very day. Happy Birthday Martha! Hope you had fun in Glasgow. Can't wait to hear what you thought about the movie and who the special guest was! Happy Birthday and congrats on having your documentary shown. I wanted to comment on Veggie Straws too. I'm a parent and I would put Veggie Straws in the same category with potato chips or crisps. The calories are ok (130 per serving) and the serving is large (38 straws), but the fat content is high (7 grams for 130 calories) and the fiber and protein contents are low (each is 1 gram per serving). The only other nutrients are 20 percent vitamin C and 2 percent iron. The main ingredient is potato flour, but there is some tomato puree and some spinach powder to justify the veggie in the name. I would prefer a baked potato chip (like Baked Lays) as they have less calories(120), less fat (2 grams), more protein and fiber (both at 2 grams) and more nutrients overall (vitamin C, iron, magnesium, thiamin, niacin, phosphorus, vitamin B6 and riboflavin). Don't take a product with "veggie" in the name at face value, be sure to check out the nutritional info! Of course, real vegetables are best, aren't they? Happy birthday Veg! As Jaylah said the US does require nutritional labels and ingredient lists as many packaged foods around the world do. Our labels probably look a bit different from yours. There is a shop in my home town that sells foods from the UK. I was a bit confused reading the label for the nutritionals at first but other than a few differences (as food are all in grams it seems, instead of oz or cups) they are very similar. The veggie straws are a bit healthier than eating potato chips (crisps to you). They are deep fried or covered in oil but they still are not as good for you as eating a baked potato and some veggie sticks like celery, carrots and broccoli. I think a lot of American children have a hard time knowing what is healthy because their parents aren't as educated about it as they could be. I know that even when I would watch my neice, her dad though lunchables were a healthy option for lunch - (not sure you have those, processed cheese, sliced deli meats - not freshly cooked) and then processed crackers and a dessert with a sugary drink. I would feed her fresh veggies, roasted turkey (that I roasted in the oven) and then some fresh fruits or fruit salad (I made the fruit salad). The cost is about the same for convenience as it is to buy a lot of food and make it yourself. So just make it yourself and have something healthier. Watched the BBC documentary yesterday, I was both humbled and inspired by your and your family's efforts in raising funds for Mary's Meals. What it must have been to see all those smiling faces in Malawi, we really don't realise how different other people's lives can be. Happy Birthday to Veg, and Happy Birthday to Mary's Meals too! Happy first Decade to you and Mary's Meals, Veg! All the best to both for a long and happy future! Did you enjoy watching Child 31? I did!! Happy Birthday Veg! Now you've only got 90 years to wait until you get to triple figures!